We’re just a couple days away from February and can I say Hallelujah?! January is definitely the Monday of the year and while it hasn’t been awful, I’m also happy to say see ya later. Anyway, with February approaching I’m Valentine’s Day dreaming. I love pink so I love all the Valentine’s Day outfits that come with this month. True, you don’t have to wear pink, but it’s just much more fun that way! If you’re looking for your perfect Valentine’s Day outfit, don’t worry I got you covered! Heart Pajamas // So cute and cozy! Perfect for a date night in with your boo or girlfriends! Black Opium Perfume // Every special evening needs a special scent. I’ve never really been a perfume gal but I’m obsessed with this one! Free People Pullover Blouse // This is my favorite purchase of the year and maybe ever. It’s a little bit pricier but so worth it. You can dress it up or down and wear it SO much. I’ve already paired it with my favorite Levi jeans and a cute snakeskin skort. I cannot wait to wear it with distressed denim shorts as the weather warms up. Hot Pink Wrap Skort // I love a skirt! I think they’re so fun and flirty + perfect for any occasion. Dress this down with a graphic tee and sneakers or dress it up with the FP Pullover Blouse above and OTK boots. Siri Heel in Rose // Pink shoes.. need I really say more?! These are so cute and the block heel makes them functional for everyday wear as spring rolls around. For a more casual Valentine’s Day pair them with boyfriend jeans and a casual sweater. 3D Flutter Sleeve Dress // I was so hesitant to order this dress because the price was killer! $20 for all these beautiful details?! Yes, Please! I was also nervous because it is one size. It fits me a little oversized but I love how flowy and flirty it is. If you’re taller (I’m 5’3″) it will still work for you! Be sure to look on Instagram Stories, I’ll share more of the fit but long story short, this dress will work for anyone! 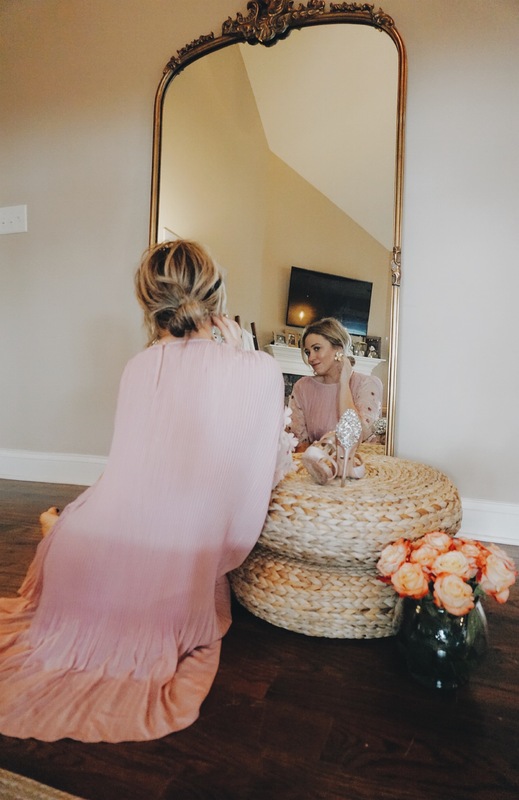 Draped Dress in Blush // This flirty little number is so cute! The draping and tulip hem make it super flattering and the price is great. You can re-wear this blush cutie in to spring weddings later this year. 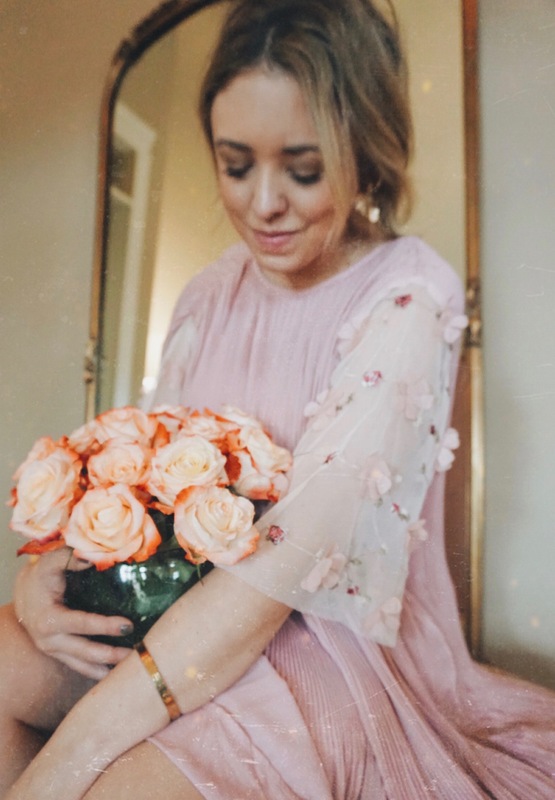 Sequin Dress // This dress is a dupe for a $600 dress I love but could never buy! I am dying for a fancy night out so I can have a real reason to purchase this beauty. I’m 100% OBSESSED. Beaded Heart Earrings // Even though these are hearts, you can wear them long past Valentine’s Day. I can’t make up my mind for pink or red, but whenever I decide today I’m ordering a pair! I love how oversized they are, yet all the reviews say they’re very light! Black Lace Dress // Every girl needs a little black dress and this one is so cute! I love how flirty the lace is and such a flattering silhouette. Hot Pink Dress // Doesn’t this just make you want to twirl!? Me too! If pink isn’t your thing, this one comes in three colors and I love the sleeves. So cute and fun!